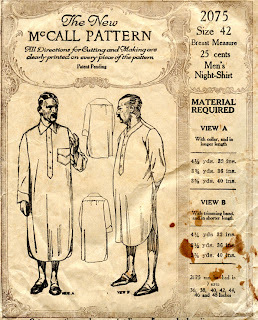 No sewing instructions were printed on the pattern pieces as was generally done with McCall women's patterns of this period. The pattern has been cut out in View B. I rather like the look of Mr. B. I think Mr. A is rehearsing his campaign speech. Pretty much everything you see is all the information available for this pattern. There was no separate instruction sheet. Men's night shirt patterns show up on ebay quite regularly. 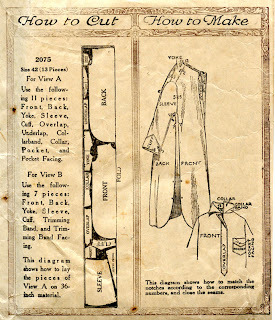 You want to navigate to Collectibles -->Sewing(1930 now) -->Patterns -->Men. One that seems to show up pretty often is Simplicity 1886. There is also a McCall pattern from the 1950's that shows up regularly, but I don't have the number. Failing finding a vintage pattern, you could experiment with taking a men's loose-fitting shirt pattern and simply lengthening it.